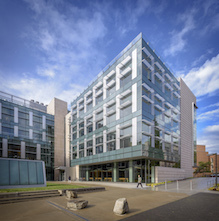 The University of Washington's newly opened Nano Engineering and Sciences Building (NanoES) relies on custom-engineered products from Wausau Window and Wall Systems to provide modern performance and visual continuity with the adjacent Molecular Engineering and Sciences Building. Demonstrating its energy-efficiency and daylight-focused design, the project is pursuing LEED® Silver certification through the U.S. Green Building Council. The $53 million dollar NanoES fulfills the second phase of a 168,000-square-foot complex located at the center of the University of Washington (UW) Seattle-based campus. The first phase, the 90,000-square-foot Molecular Engineering and Sciences Building (MolES), was completed in 2012. Hoffman Construction Company was involved from the earliest stages of the project's development. "When we put the project out for bid, all [trades] came in well over budget," remembers Hoffman Construction Company's project manager, Bob Vincent. "This prompted us to rethink the whole system with the project team with our goal to get the right price for the curtainwall." To better align with the project's budget, Herzog Glass sought additional input from Brad Glauser, Wausau's Northwest Territory manager. Vincent continues, "Herzog Glass, Brad and Wausau were of substantial help in reducing costs by proposing a standard unitized system instead of a custom-engineered one. We went through many iterations before arriving at one that is effective, efficient and good looking." Contributing to the consensus-based decision, Herzog Glass worked with Wausau's Design Assist Team to facilitate a three-day series of design charrettes. According to Glauser, these intense planning sessions brought together representatives from the UW, ZGF, Hoffmann Construction Company and Herzog Glass to develop a vision and best approach for the building envelope. Glauser emphasizes that the initial coordination, especially with Herzog Glass, was paramount to the success of the project. He notes, "We needed to work together to implement project-specific means and methods to ensure proper and safe installation, on a postage stamp size of a construction site that allowed almost no room for staging and critical equipment." Ron Dunham of Herzog Glass agrees that working together with Wausau at the front end of the project benefited everyone. "Our estimating team met with Brad and ZGF to create the proposal details and meet the architect's dream for this project," he says. "As it was an addition to an existing facility, we needed to match the MolES building's system's look as closely as possible," continues Dunham. "Wausau's engineering is phenomenal and their willingness to re-create the system for the new building was very important to the success of the project." Vincent also emphasizes the unitized curtainwall's cost efficiency as key success factor and adds, "It turned out great. The client is very pleased. It looks like an extension of MolES, just as they wanted." The NanoES building, like the adjacent MolES building, features four stories above grade and one story below. The second through fourth floors of the NanoES Building are programmed research laboratory spaces. Two active learning classrooms, one large and one small, and those classrooms' supporting breakout spaces comprise the first floor of the NanoES building. Also on the NanoES building's first floor is a shared, informal learning center that students can use both before and after classroom sessions. "Transparency, access to daylight and openness were high priorities," says Glauser. 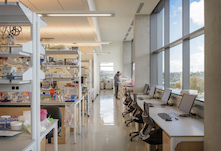 "Daylight-filled research labs offer views of the campus for those inside the building. For those on the outside looking in, the building creates a connection to the progressive research underway at each workspace." Daylight flows deep into the building's interior as its laboratories and offices are separated with glass walls and doors that also maintain a visual connection between these spaces. Based on the charrettes' targeted value, design goals, code requirements and the LEED Silver criteria, Wausau's four-sided structurally glazed (4-SSG) INvision™ unitized curtainwall system was selected for the project. "The 4-SSG unitized curtainwall was glazed and sealed in Wausau's factory-controlled conditions. This achieved the targeted designed performance and industry-leading, 10-year warranty required for the project and for the UW campus facility plan," Glauser explains. He continues, "The units were built one lite wide by one floor tall, with interlocking vertical mullions that aligned with the adjacent rain screen's stone façade, thus creating a true continuous thermal envelope. The pre-assembled units made the overall system easy to install on the job site with an extremely quick envelope enclosure. This was a critical reason the INvision system was selected, and resulted in months of schedule and cost savings, enabled by skilled and effective Local 188 union labor." Some of the curtainwall units on NanoES were up to 16 feet tall. To carefully install each unit, Dunham says, "We used lift equipment to hoist it in place, then used embeds at face-of-slab to anchor J-clips. It was an easy, simple, straightforward process. The system went together well." He adds, "Wausau's engineering is phenomenal. I like their shop drawing package and awesome engineering package. This was a real collaborative effort with Wausau as a partner." Glauser adds that another outcome of the early design assist and collaborative approach was a reduction of Addenda, Requests For Information and Architect's Supplemental Instructions submitted during the pre-construction and construction process. He says, "This allowed the unitized curtainwall portion of the building's envelope to be enclosed within five weeks, and helped keep the project's schedule trend months ahead, while staying on budget." In total, Herzog Glass installed more than 22,000-square-feet of Wausau's unitized curtainwall on UW NanoES. The majority is INvision 8250i-HRX Series 4-SSG curtainwall with custom, 6-inch-deep aluminum fins at vertical members. Integrated within the curtainwall are Wausau 4250z Series zero sightline, project-out awning windows with both manual and motorized operators. 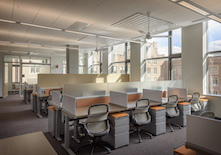 In the offices, the windows are programmed to automatically open at night to provide natural ventilation and lessen energy load demands on the HVAC system. Energy efficiency is an essential part of achieving LEED certification for NanoES. Contributing to this, Wausau's curtainwall features insulating, thermal, polyamide strut to separate the inside and outside aluminum framing members, which reduces the amount of heat transfer, therefore helping save energy and increase occupant comfort. Further enhancing energy efficiency, occupant comfort and daylighting design principles, both the windows and curtainwall lites incorporate Viracon's VNE-63 solar-control, RoomSide™ Low-E, argon-filled, insulating glass. The low-e, interior surface coating works by reflecting indoor heat back into the room and improving thermal efficiency. * Wausau's ClearStory™ 24-inch-deep exterior sun shades, which help intercept unwanted solar heat gain before it can impact a building's HVAC system's load and economize natural light by redirecting it inside the building. * Wausau's customized shadow boxes, which are similar to those on MolES to add visual depth. * Wausau's structurally glazed, unitized handrail systems integrated directly in plane with the INvision curtainwall, installed on the building's wall parapet and green roof. * Tubelite's Therml=Block® entrances with thermal strut, customized electric security and automatic hardware. Durable, recyclable material choices on UW NanoES support its sustainability goals and also minimize the buildings' maintenance costs, while providing long lifecycles. The aluminum used to produce Wausau's and Tubelite's architectural products is made from a high recycled-content billet composition and can be recycled again at the end of its useful life on the building. The curtainwall, window and entrance systems' metal framing members, plus the shadow boxes, the sun shades and the accent fins, all are protected with two-coat mica coating applied by Linetec. With Linetec's stringent factory-controlled processes, the 70 percent polyvinylidene fluoride (PVDF) resin-based liquid paint meets the American Architectural Manufacturers Association's (AAMA) 2605 industry standard. Linetec utilizes a multi-step pretreatment, application and curing process, using advanced techniques and equipment to ensure quality and uniformity in all paint projects. As a recognized environmentally responsible finisher, Linetec captures the liquid paints' volatile organic compounds (VOCs) content using a 100 percent air capture system and safely destroys the VOCs with a regenerative thermal oxidizer. Linetec then reuses its heat energy byproduct to improve process energy efficiency. This process of reuse is completed before the material exits the paint line. 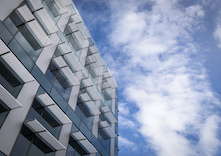 The Silver Shadow color for most of the NanoES building's finished aluminum components matches the neighboring MolES building, creating the desired continuity within the UW campus. "The combination of durably finished, 4-SSG unitized curtainwall and high-performance glass achieved UW's requirements," summarizes Glauser. "We exceeded the national forerunning Seattle Energy Codes, as well as UW's energy-efficiency goals with low solar heat gain coefficient, low U-Factor and high condensation resistance. At the same time, high visible light transmittance was maintained, providing occupants with access to daylight, a transparent connection to views and interior comfort. We stayed ahead of schedule and within budget. In my book, this definitely is a success story." Elaborating on this success in the Daily Journal of Commerce, ZGF's associate partner Nicole Cooper, AIA, concluded, "The strong partnership between UW and the design team, as well as a commitment to sustainability, brings the Molecular Engineering and Sciences Building and the Nano Engineering and Sciences Building together to create one high-performance building that fosters a collaborative research environment for years to come."